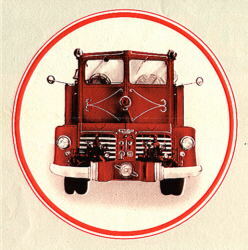 The Spangler Dual was an experimental fire truck manufactured by Hahn Motors, Inc, from Hamburg, Pensylvania. 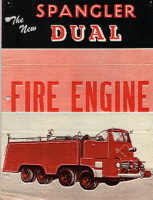 The fire truck was sold by D.H. Spangler Eng. & Sales Co. The only one made was in use with the Friendship Fire Company of Morgantown Pennsylvania. 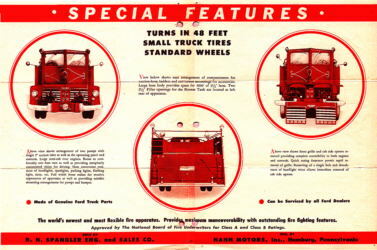 It was in service for only a short period when it was returned to the manufacturer. Both units where scrapped due to many technical problems. The chassis was mainly made with Ford components and parts like axels, gearboxes, and powered by 2 Ford V8 engines of 100 HP each. The truck was equiped with 2 Barton-American 500 gpm centrifugal pumps, a 1500 gallon boostertank and 4 automatic type 1/2-inch booster reels, a total of 5000 feet.